It was a pitch-black night in La Crosse, Wisconsin. I had just finished moving my things into my new house for my sophomore year of schooling. Ecstatic, I had to do some inspecting around the room. Upon opening the window blinds, I saw it. Its body alone, comparable to the size of a quarter. Its fangs, the biggest I have yet to see coming from this class of organisms. It had a stripe like pattern and the creepiest thorn-like structures protruding from its eight legs. Can you guess what class this species is from yet? 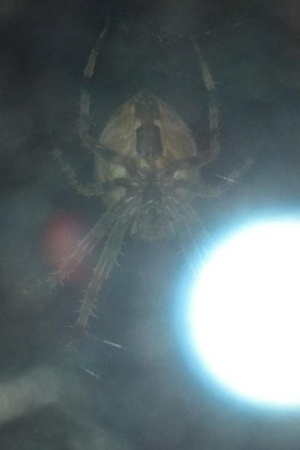 This arachnid freaked me out! I began to pound on my window, thinking I could spook it off. To my surprise it would not budge. No matter how close I was or how hard I pounded this spider did not even budge. This was HIS home! Both fascinated and crept out by this organism, I just had to check on it the next morning. To my disbelief, it was gone, a nocturnal spider! To this day I still have no idea where such a large spider could hide during the day! I had no idea where it was. Just thinking about this spider crawling around my room gives me the willies! Characterized by the two spots on its underside, the stripe like pattern on its legs with thorny projections and nocturnal lifestyle, this particular arachnid is named the Western Spotted Orb Weaver spider or Neoscona oaxacensis. One characteristic that sets this species apart from the others in its genus is that the body is seemingly hairless, at least to the visible eye. I encourage you to browse through the different tabs on this site to learn about this species, or you can check out different organisms from other biology classes at the University of Wisconsin La Crosse by clicking on the link below! Or continue on to the next page.